Before your mind starts to wander to the widely debated female hormone that’s fluctuation can send us femmes d’un certain âge spiraling through rapid mood swings, drop the final “e” and add an “o” and you will realize my ode is to the terrific, tried and true French herb, tarragon, not the natural chemical so essential to the female of the species. There are so many sensory delights at the French markets, and quite a few that I am completely nutty for, and estragon is certainly one of them. 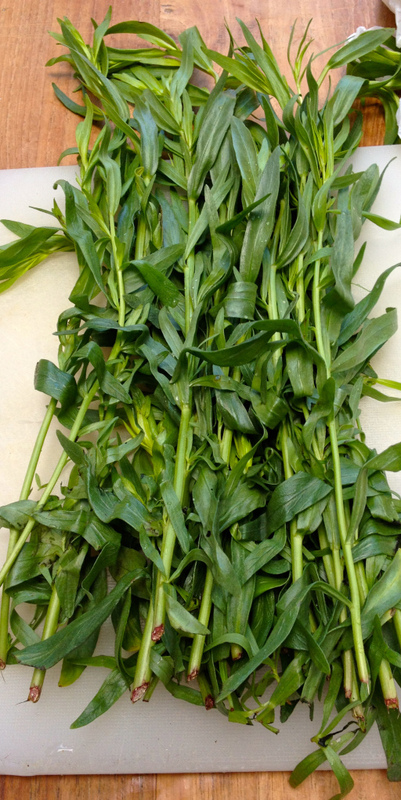 Prior to moving to France, I had rarely cooked with tarragon, and I had certainly never cooked or eaten fresh from the market or garden tarragon. Now I can’t seem to get through a day without it.